Shopfront signage is arguably the most important signage there is. Without a good shopfront sign, no one will be able to find your business, so getting your signs right is crucial. There are many methods to creating shopfront signs, and seen above is just one of the ways you can have your signs made. Cut out acrylic lettering, combined with digital print and traditional vinyl, laid onto aluminium composite panel – these are the four elements used in the “1 Stop 4 Beauty” signs in Malaga. The cut out lettering makes the logo stand out, while the butterfly uses digital print, as do the photos on each end. We’ve used long-lasting solvent-based inks with a protective overlaminate to ensure the prints aren’t affected by UV. The cast vinyl is laminated to the face of the acrylic and the sign was installed in Malaga in less than a day. Now the shopfront stands out and the customer was extremely impressed. 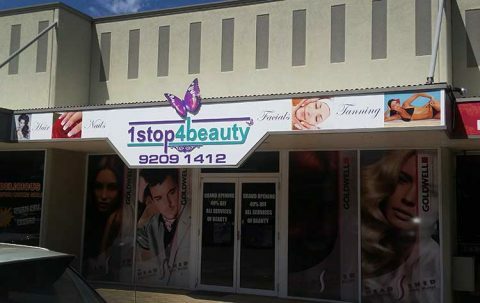 You’ll feel the same when you get Perth Graphics Centre to complete your shopfront signage.